Get the updated guide to active and passive control systems for buildings. To capitalize on today's rapidly evolving, specialized technologies, architects, designers, builders, and contractors work together to plan the mechanical and electrical equipment that controls the indoor environment of a building. 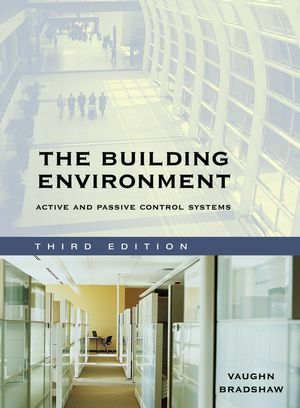 The Building Environment: Active and Passive Control Systems, Third Edition helps you take advantage of design innovations and construction strategies that maximize the comfort, safety, and energy efficiency of buildings. On-site power generation, including wind turbines, solar photovoltaic cells, fuel cells, and more. Plumbing systems, fire protection, signal systems, conveying systems, and architectural acoustics. Procedures and/or formulas for performing heat loss, heat gain, and energy use calculations, determining the rate of heat flow, calculating solar energy utilization, doing load calculations, and more. Details on the latest building codes and standards references. New information on the sustainable design of building systems and energy efficiency, including new technologies. The latest thinking and data on a building's impact on the environment, indoor air quality, and "sick building syndrome." Design economics, including the payback period, life-cycle cost, comparative value analysis, and building commissioning. A practical on-the-job tool for architects, designers, builders, engineers, contractors, and other specialists, this Third Edition is also a great reference for architecture students who will lead tomorrow's design teams. VAUGHN BRADSHAW, PE, is a former instructor in the School of Architecture at Washington University. Expanded coverage of indoor air quality and "sick building syndrome"